These are highly flexible and very capable automatic sputtering systems. The 9000 and 9550 share a common process module. The 9000 may be configured either for atmospheric cycling to load a batch or with a single shot load lock. 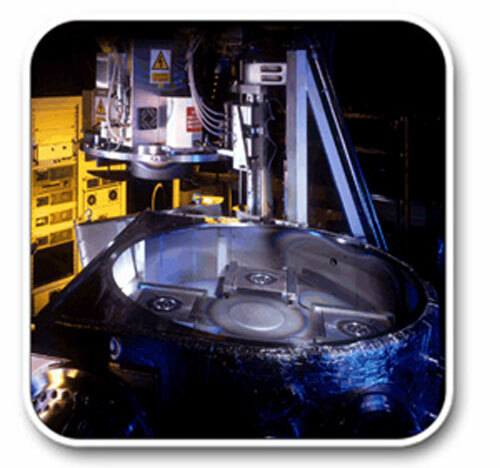 When this module is mated to a wafer handling platform that accesses a vacuum cassette load lock then the machine designation becomes the 9550. Two alternative electrode populations are offered; either, Four 330 mm cathodes, or Six 250 mm cathodes. Each cathode may be configured for RF diode, DC, RF or DC/RF magnetron operation. The magnetron cathodes are also available with rotating magnet arrays. The rotating substrate table may be configured to accept a variety of differing substrate formats. The table may be rotated at speeds from 2 to 30 rpm. The table height can also be raised and lowered to optimise the process.